The quiet seaside village of Candidasa boasts a rich heritage close to many of Bali's most important historical landmarks, ancient kingdoms and palaces, making it an excellent base to explore the region. 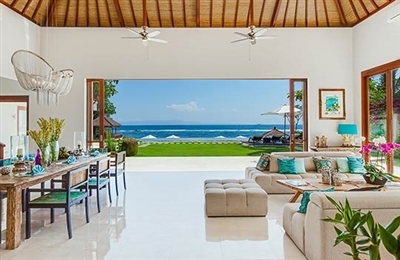 This beautiful, undeveloped area is set in the Island’s eastern regency of Karangasem, well away from the excesses of mainstream tourism, with Mt Agung, Bali’s most sacred and mystical volcano, providing a dramatic backdrop to the scene. There is a charming collection of restaurants and simple souvenir shops in Candidasa, as well as a few basic mini-marts. Close by is the 700-year-old walled village of Tenganan, where the residents practise a time-honoured lifestyle based around ritual and ceremony. The fortress-like village has become a living museum, and many of the houses also function as shops and workshops where expert craftsmen and women perform their centuries’ old skills. The beach at Candidasa is sandy and golden, albeit narrow due to erosion. There is however, a beautiful beach known as Pasir Putih five kilometres to the east and snorkelling and diving off Candidasa is good with some excellent sites close to the shore and accessible by local boat. 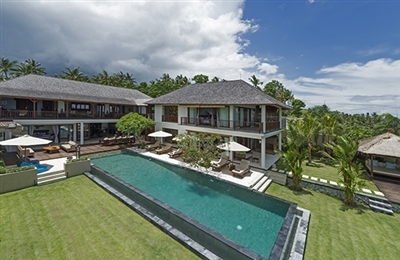 Within a few kilometres are two of Bali’s most prestigious resorts, Alila Manggis and the world famous Amankila. Padang Bai Harbour, the stepping off point for Lombok, is a further nine kilometres around the bay, and here you will find the Blue Lagoon, another superb snorkelling and dive site. As soon as we walked into Villa Tirta Nila, we could feel the love that has been poured into it by its thoughtful and creative owners. The villa has a beautiful energy and much of that must be credited to the small team of helpful, friendly staff who are clearly very happy to be working there. We were warmly greeted by the manager, Gusti, and a very special mention must go to Sumi, the cook, whose dishes were delicious. From the villa’s spectacular seafront setting and breath-taking views, to its seaside terrace and dining pavilion, clever architectural design, and its gorgeous, stylish interiors, eye-catching artwork and artefacts, beach-worn chic furnishings, comfy beds and sofas, immaculate bathrooms and kitchen, and a thoughtful array of books and board games, the provision of two bicycles, garden, pool, and sand-floored volleyball court, we loved it all.